HOUSTON – Nine lawyers with the Houston commercial and intellectual property litigation firm Ahmad, Zavitsanos, Anaipakos, Alavi & Mensing P.C., or AZA, earned selection to the 2018 edition of The Best Lawyers in America. AZA partners Joe Ahmad, John Zavitsanos, Demetrios Anaipakos, Amir Alavi, Todd Mensing, Elizabeth Pannill Fletcher, Steve Mitby and Tim Shelby, and of counsel David Warden are listed among the nation’s best. All of these lawyers are making repeat appearances on the list, most notably Mr. Ahmad who has been selected for 16 consecutive years, and Mr. Zavitsanos for 13 years. The eight partners were selected for their work in commercial litigation, with Mr. Mensing earning additional recognition for construction litigation. Mr. Warden is recognized for his expertise in intellectual property litigation and patent law. Best Lawyers honorees are selected through a peer-review survey relying on confidential evaluations by other lawyers in the same and related specialties and within the same geographic regions. Best Lawyers is the oldest peer-review publication covering the legal profession. Houston’s AZA is also on the U.S. News-Best Lawyers list of Best Law Firms, ranked in the top tier of area metropolitan firms for commercial litigation. “Ahmad, Zavitsanos is top-notch. It is good as any firm in the U.S. and better than 99.9 percent,” a vice president at a publicly traded energy transport company told the researchers. 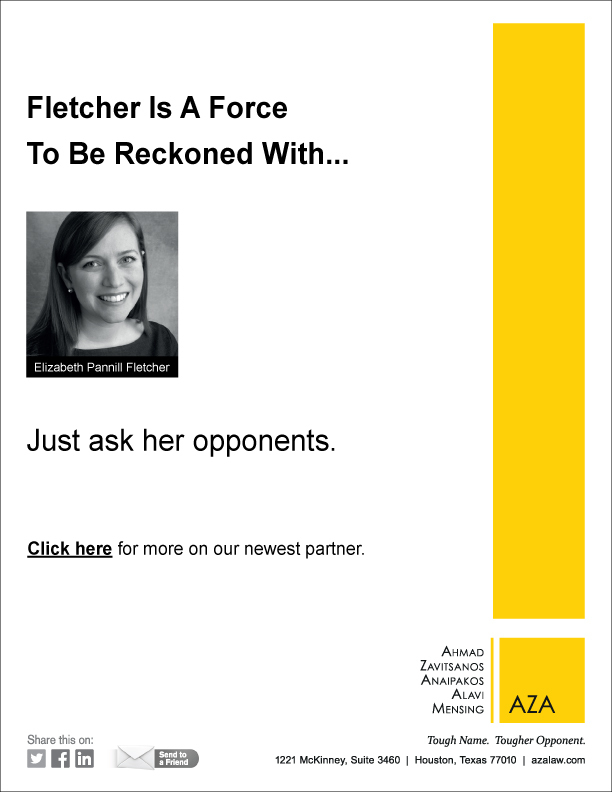 “AZA is dedicated to working in the best interests of the client. Their judgment and expertise of their attorneys are unquestioned. The firm is driven by results, not by cost, and can be trusted to handle the most complicated commercial litigation cases,” said a senior vice president at a national healthcare company. Ahmad, Zavitsanos, Anaipakos, Alavi & Mensing P.C., or AZA, is a Houston-based law firm that is home to true courtroom lawyers with a formidable track record in complex commercial litigation, including energy, intellectual property, and business dispute cases. AZA is recognized in Chambers USA 2017 among the best in Texas commercial law; U.S. News – Best Lawyers list as one of the country’s best commercial litigation firms for 2017; and Law360 as one of only 13 Texas Powerhouse law firms. National corporate counsel named AZA one of the country’s best in client service among law firms serving the Fortune 1000.